£1 coin new March 2017, old up to Sep 2017. Levels of counterfeiting of coins taken from here. The new £1 coin is being introduced during 2017 because the levels of counterfeit coins in circulation reached 3%. the National Crime Agency (I didn’t even know we had one) reports removing 430,000 notes of face value £8.05m during 2014. The 2013 figures were 693,000 notes, value £11.76m [source]. This explains the move to polymer notes. The reasoning is, to quote the webpage, cleaner, safer, stronger. The linked page tells you all sorts of stuff not relevant here and a little about how the notes are made. I have copied table 6-2 which labels the designs used on the notes in circulation only because I didn’t actually know them (and felt one should). In general the new notes are expected to last 2.5 times longer than the old ones, though no doubt that will be coloured by the attempts to fake these in subsequent years. 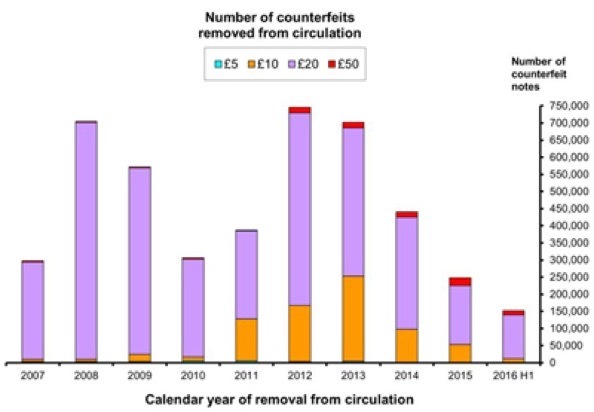 Number and notional value of counterfeits removed from circulation (rounded to nearest 1,000). The 2016 data is only for the first half of the year. Previous comments on creating tables apply; this is not at all easy. So, unsurprisingly, I wondered what the level of counterfeiting is. The BBC gave me a little: notes in circulation, 2009 £2.6 billion, £1 coins 30-40 million. I eventually found a report from 2009 (in list at bottom), some of which I copy on the right. What this represents in total value depends a lot on whether the sampling is representative of the total cash available or that actually in circulation. On the BBC figures the 2009 figure looks like £1million, but the 2014 figures suggest that the total fake coinage is the 30 million above and that the pounds in circulation are £1553Million. Questions I want to ask include: How much money must be fake before there is action to change the currency? How long does it take to do that? What is the cost of doing so (and what is the cost of making a coin? What is a coin worth as metal? How do you work out how much is fake? How does this compare with other problems (including crimes) that deprive the nation of value? How does this compare with other nations? Latin inscriptions (blue, left) from the edges of coins. Where a motto is used, I have given the source, e.g. the last is the motto of Edinburgh. That for Newcastle is “Fortiter Defendit Triumphans” (Triumphing by a brave defence, how appropriate for the football team) and for Manchester “Concilio et Labore” (By wisdom and effort, not to do with football). While £3.275 million in 152,000 counterfeit notes was removed from circulation in the first half of 2016, there are about 3.5 billion notes in circulation at a value of £66 billion. So about 0.00434% is fake and found. The situation with coins is far worse, at 3% in 2014; hence the need for action. Can I compare these figures with other countries? I tried to find figures for forging of the euro. One can only work from the figures of forgeries discovered and removed from circulation, so that countries that do not work hard to sustain the integrity of the currency may well be unaware of the level of forgery. The 2015 figures are that 454,000 notes were removed from around €17 billion in circulation, 0.00267%, a similar level to the UK situation before changing to polymer notes. According to a report from Al Jazeera, a lot of fake Euro notes come from Naples. My reading suggests that the life of a note might be ten years – which might also be the time it takes for the technology required to make the note to become affordable to those who want to be making forgeries. The most commonly forged note in UK currency is the £20, probably because there are many in circulation. Of the Euro, the targets of choice are the €20 and €50. For the dollar, the $100 offers the greatest return. The Americans say (wikipedia) 1 in 10,000 notes is counterfeit, but that may be 1 in 4000. At a lower bound of 0.01%, that is many times higher (40 or more) than the Sterling or Euro problem. The problem here is that dollars are used worldwide as a substitute for home currency so it would be unsurprising to learn that the bulk of forged notes lie outside US shores; indeed, in 2002, twice as much was intercepted abroad as at home. Of course, there are no figures published that I can find for the Reminbi, but I can report that there was a serious problem with the 100RMB note 2008-2011 and what one did was use it and not take it to places where it would be simultaneously yours and worth nothing, such as the bank. If you could identify where you’d got a note from, it was worth pursuing, but so much money changes hands so often, it is virtually impossible to track it back to source. The rupee is in a more difficult position. A report I found seems to suggest that the problem is large (2015) and points to Pakistan as a source. This is quite possibly the strongest reason for withdrawal of the ₹1000 note in Nov 2016. 2011 counterfeit removal from circulation, $261 million. Perhaps $220 million in circulation at any one time (but wikipedia pointed out that $70 million was the prediction with $220 million as the upper bound). A significant fraction of that recovered was recovered in the UK. No surprise to me; we’d co-operate strongly in finding it and pursuing sources. Indeed, that recovered in the UK shrank dramatically in 2009, matched by a change the other way in mainland Europe. It would be typical (of the way our press shades meanings without actually saying something) to read that the large amount found in the UK means the UK being full of fraudsters. Most fake money in the US is the $100 note [90%], while in the UK [90%] and Canada [66%] it is the $20. Counterfeit money [$220 million] is as nothing compared to identity fraud [$37 billion] or the counterfeiting of other goods [$250 billion]. Here’s an Australian opinion. No doubt the author went with what information he had available, as do I. As the author of that last diagram says in conclusion: Counterfeiting rates in Australia continue to be low in both an absolute sense and relative to rates experienced overseas. As a result, public confidence in Australia's banknotes remains high. Historical experience in Australia and overseas shows, however, that counterfeiting rates can increase sharply in a short space of time and, even when there is little cause for concern, public confidence can be easily reduced by incorrect information. For these reasons, the Reserve Bank continues to review and develop its strategies aimed at minimising the risks of counterfeiting and maintaining public confidence in banknotes. It remains true that it is very difficult to measure the counterfeiting rate if you don’t try hard to find out. That really requires a significant flow of notes to go past a testing opportunity. So for the dollar especially, where large amounts never reach home shores, there is quite possibly no check of a note until it is destroyed, deliberately or accidentally. top pic from google images on search, but not found again on a second search so as to write this line properly. Arsenal.se had its page explaining how to do this removed. Fair enough: creating such a note in paper form is a crime in Britain. Why is the new coin shaped the way it is? So you can extract it from <social group> with a spanner. Depending on your location, choose social group to fit your preference. Scotsman, Yorkshireman, plumber, Tory politician, the rich, etc. The data includes counterfeit Bank of England banknotes with a discovery date up to 30 June 2016 and recorded by the Bank of England by 24 August 2016. 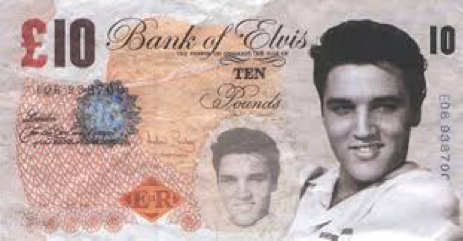 The Bank of England continues to receive some counterfeits several months after they are found because, for example, the police may retain them as evidence. Consequently the figures may be subject to revision. Chart 1 No. 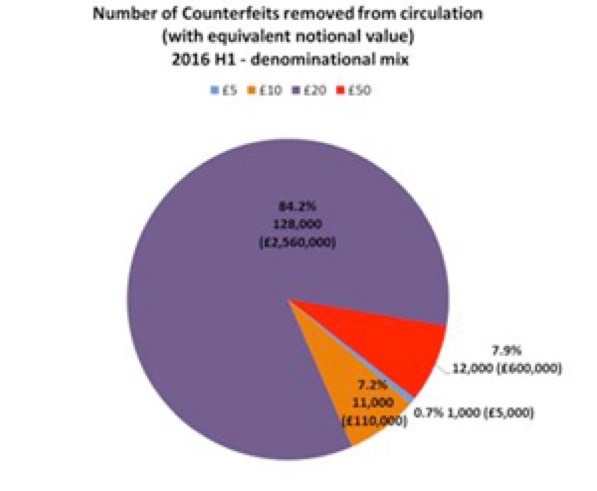 Counterfeits removed from circulation (the purple is the £20 at 84.2%). Colours match the next chart down, too. 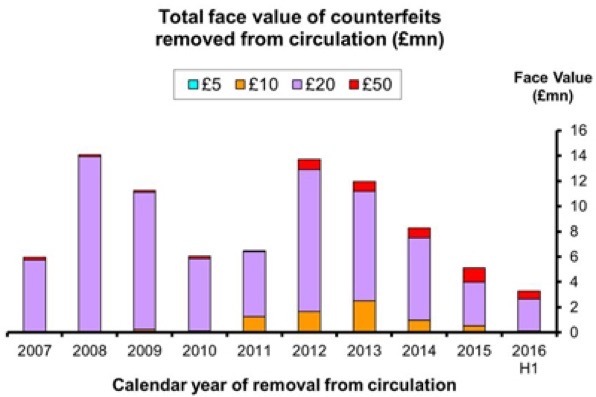 Chart 3 Total face value of counterfeits removed from circulation. 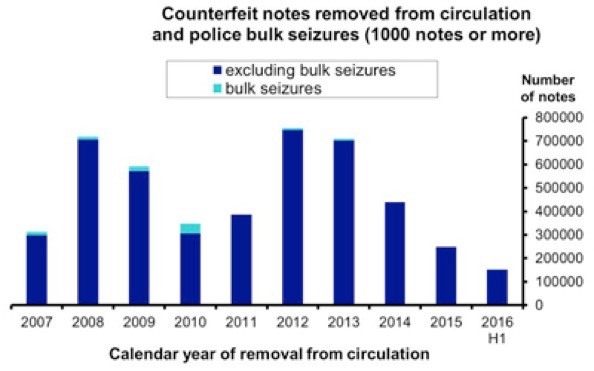 Chart 4 shows the number of counterfeits taken out of circulation each year by the Bank and "bulk seizures" of 1,000 notes or more, which are intercepted by the police before they enter circulation.